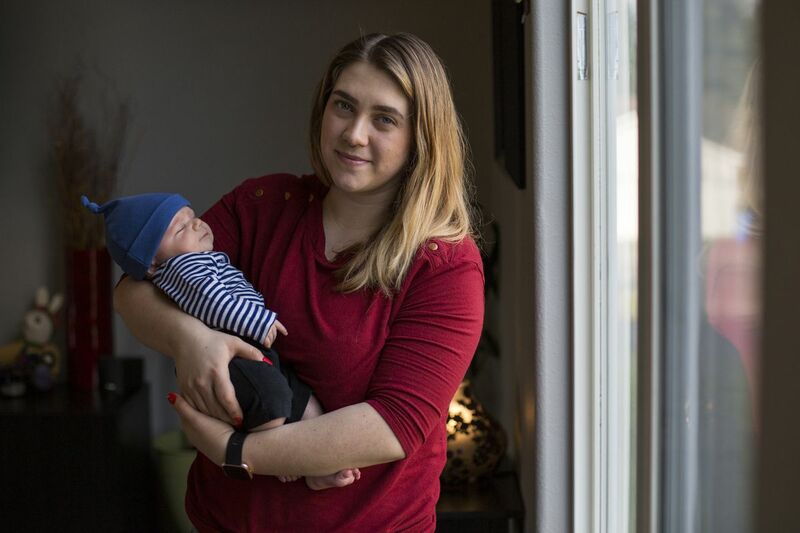 Amber Gorrow holds her son Leon, 8 weeks, at their home in Vancouver, Washington, on Wednesday, Feb. 6, 2019. When the measles outbreak started in Vancouver last month, Gorrow decided to stay at home with her son as much as possible so he wouldn't be exposed before he is old enough to get the vaccine. Photo for The Washington Post by Alisha Jucevic. 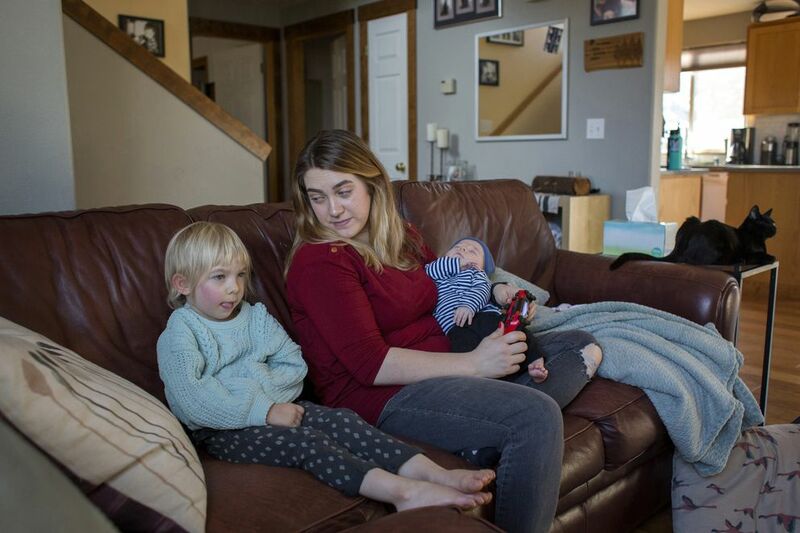 VANCOUVER, Wash. - Amber Gorrow is afraid to leave her house with her infant son because she lives at the epicenter of Washington state’s biggest measles outbreak in more than two decades. Born eight weeks ago, Leon is too young to get his first measles shot, putting him at risk for the highly contagious respiratory virus, which can be fatal in small children. The Pacific Northwest is home to some of the nation's most vocal and organized anti-vaccination activists. That movement has helped drive down child immunizations in Washington, as well as in neighboring Oregon and Idaho, to some of the lowest rates in the country, with as many as 10.5 percent of kindergartners statewide in Idaho unvaccinated for measles. That is almost double the median rate nationally. Libertarian-leaning lawmakers, meanwhile, have bowed to public pressure to relax state laws to exempt virtually any child from state vaccination requirements whose parents object. Three states allow only medical exemptions; most others also permit religious exemptions. And 17, including Washington, Oregon and Idaho, allow what they call "philosophical" exemptions, meaning virtually anyone can opt out of the requirements. "You know what keeps me up at night?" said Clark County Public Health Director Alan Melnick. "Measles is exquisitely contagious. If you have an undervaccinated population, and you introduce a measles case into that population, it will take off like a wildfire." Amber Gorrow, her daughter Eleanor, 3, and her son Leon, 8 weeks, pick out a show to watch after Eleanor's nap on Feb. 6, 2019. Eleanor received her first measles vaccine, but Leon is still too young to get the shot. Photo for The Washington Post by Alisha Jucevic. When she picks up her 3-year-old from preschool, she gently pushes grubby little hands away from the baby. She canceled a family outing to a children's museum, regular trips to the library, the weekly Costco run and play dates for her daughter. "I hate to say it, but I'm even nervous about having people over - especially people who have small children and I'm not sure where they stand" on vaccinations, said Gorrow, 29, who had her older child vaccinated. Measles, which remains endemic in many parts of the world, generally returns to the United States when infected travelers bring the disease back to pockets of the country where some parents have chosen not to vaccinate their children. When immunization rates fall below a certain threshold, outbreaks can occur; pregnant women, young children and people with compromised immune systems who can't get vaccinated are especially at risk. Last year, 349 cases were confirmed across 26 states and the District of Columbia, the second highest total since the disease was declared eliminated from the United States in 2000, according to the Centers for Disease Control and Prevention. Since October, an outbreak in New York's Orthodox Jewish community has sickened 209 people. In the first month of 2019, 10 states, including New York and Washington, have reported cases, all signs of a resurgence of a disease that is entirely preventable with a vaccine that authorities say is safe and effective. In Washington, with late winter and spring generally the height of measles transmission, health officials say they are scrambling to stop the disease before it can spread further - spending about $200,000 so far to track down hundreds of unvaccinated people who may have been exposed. Clark County officials have directed hundreds of families who may have been exposed to the virus at more than three dozen locations - including a Portland Trailblazers basketball game, schools, churches and stores such as Costco and Walmart - to keep their kids home from school for 21 days to avoid exposing others. They're encouraging parents to vaccinate their kids if they haven't already, and are pushing back against rumors and misinformation, including that self-medicating with vitamin A will prevent measles. Melnick said the county is also spending precious time and resources addressing false ideas being spread by anti-vaccine advocates, who he said posted "ridiculous" misinformation as comments on the county health department's Facebook page. "That's what we're up against," he said. "It shouldn't be called an outbreak," Seattle-area mother Bernadette Pajer, a co-founder of the state's main anti-vaccine group, Informed Choice Washington, said of the measles cases, arguing that the illness has spread only within a small, self-contained group. "I would refer to it as an in-break, within a community." Like many in her group, Pajer considers the risks from measles to be less dangerous than those posed by the vaccine itself - a claim that can be traced back to a retracted and discredited 1998 paper that inspired the modern anti-vaccination movement. In fact, health officials say the virus is so contagious that if an unvaccinated person walks through a room two hours after someone with measles has left, there's a 90 percent chance that an unvaccinated person will get the disease. People can spread measles for four days before the rash appears and for four days after. Martina Clements, 41, a Portland mom who didn't vaccinate her two children until recently, said the anti-vaccine community uses fear to raise doubts about vaccine safety. But parents who support immunizations can be belittling. "On one side, they make you afraid, and the other side they make you feel stupid, and you get stuck in this middle where you feel beat up by both sides," she said. Clements eventually changed her mind, deciding to give her kids the shots after a doctor at a vaccine workshop answered her questions for more than two hours, at one point drawing diagrams on a whiteboard to explain cell interaction. He was thoughtful, factual and also "still very warm," she said. Peter Hotez, a vaccine scientist and dean of the National School of Tropical Medicine at Baylor College of Medicine in Houston, whose daughter has autism, wrote a book, "Vaccines Did Not Cause Rachel's Autism," to counter the anti-vaccine lobby. "Their response seemed to say this was not their fight because it's a state issue, not a federal one," Hotez said. "But I disagree. I feel that anything adversely affecting the public health of Americans is certainly within" the federal government's purview. Amber Gorrow demonstrates the screen she uses on her son Leon's carrier when she brings him to pick up her daughter from preschool. The screen helps prevent other children from trying to touch Leon or get too close. Photo for The Washington Post by Alisha Jucevic. On the same day that Inslee declared a state of emergency, Washington Rep. Paul Harris, a Republican from Vancouver who represents Clark County, introduced a bill that would prohibit all exemptions from the measles vaccine requirement save for medical and religious reasons. "It's about public health," he said. "People have told me they won't go to the store or out into the community as much because they have cancer and are getting chemotherapy. So it doesn't just impact those people who choose not to get vaccinated." "It's the right thing to do," he said. "This is something we can actually control if we choose to." The Washington Post’s Sun reported from Washington, D.C. Alice Crites contributed to this report.